I took a look at the comp and it looks good. Your DOF seems less "fake" than a lot of the DOF you see being faked. At least it's real variable blur that's good quality and seems fast and responsive to work with. Thanks for checking it out. I like the UI you used in yours. It'd be nice to make something similar for this effect in the long run but not really needed for a FFGL as I plan to use it. The x/y controls for the linear gradient can get a bit confusing as it is now. Slight change made and replaced the file. I had an unnecessary Render Layer to Image node in there for some reason. Needs a tweak to the boolean name to display correctly in Resolume but running well enough. (Or is there a better way to switch between the two styles?). 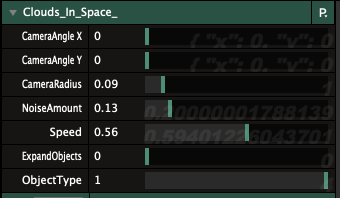 Also noticed that the position sliders numbers do not display minus number positions, they are displayed as 0-1 in Resolume. Needs a tweak to the boolean name to display correctly in Resolume but running well enough. (Or is there a better way to switch between the two styles?). FFGL limits parameter names to 16 chars, so you'd have to pick a shorter name. Or split it into two plugins, one for linear and one for radial. Also noticed that the position sliders numbers do not display minus number positions, they are displayed as 0-1 in Resolume. Vuo converts the 0-1 range displayed in Resolume back to the original range in your composition. For example, if your published input port has range -10 to 10, it will display in Resolume as 0-1, but the numbers fed into your composition will range from -10 to 10. An 0.25 in Resolume will become a -5 in your composition. The reason for doing it that way is a limitation of Resolume (and other FFGL hosts we've looked at). Although the FFGL spec describes a way to override the default 0-1 range, Resolume doesn't support it. Thanks for the info. I sent the Resolume team these Effects to test and posed them the same questions. Joris replied with info about how to display different values, so I guess they do support it: 'Input values for sliders are fixed to 0...1 in the FFGL spec. The plugin can display a different value by calling GetParameterDisplay. This can return a char pointer to display whatever string you need.' I guess that might be something you can add under the hood....? Like Joris said, it doesn't affect the 0-1 range of the slider. Is the overlay helpful? I think we could add it easily. I just wasn't sure it would be helpful. Yes I think adding the overlay would be good. Any extra visible info is useful, especially when it come to understanding negative values that we use for screen space in Vuo.